This quick-to-stitch project is sure to please all toothless kids in your family! Designed to be appropriate for both boys and girls, this easy design can also be personalized. Our model uses a pre-finished door hangar that is a great solution for getting those tiny teeth delivered (no more lost teeth under pillows!). 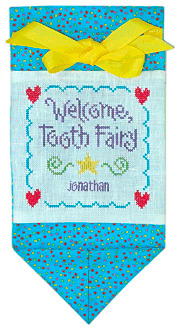 However you finish your project, a visit from the tooth fairy is a sure thing!